Rupert kindly invites you to apply for the 7th edition of Rupert Alternative Education Programme, which will take place between March and September 2019. The deadline for all applications is February 15 (Friday) midnight, EET. The Rupert Alternative Education Programme isa para-academic educational platform, combining self-study, creative practice, interdisciplinary exchange and professional development. Each year, the Programme responds to current concerns and issues in the cultural field and is developed in close collaboration with the participants. . This year, we are exploring the role of artistic initiatives and institutions in a time of global political and ecological instability. This year the Programme is aimed specifically at young curators and those working in creative and interdisciplinary fields, such as writers, art critics, theorists, journalists, art managers, founders of artistic initiatives and platforms, as well as artists and researchers from other fields. In the 7th Rupert Alternative Education Programme, we want to re-think issues in the international contemporary art field, while considering closely the local cultural sector. In the Programme, we will be asking, how can we use and share our creative and imaginative work? How can we not only actively participate, but also change the cultural environment, using our skills and the opportunities around us? Together with local and international guests speakers and mentors, we will discuss the importance of non-institutional art platforms and the practical issues in establishing and maintaining them. Drawing on a range of perspectives and experiences, the Programme will explore and develop the participant’s own ideas and projects. The para-academic nature of the Programme means that applicants are active participants of the programme, and so they can change its direction and r momentum, while be instrumental to its development.. The overarching theme of the Programme is a framework through which participants explore their particular interests and needs. While the Programme should be the participants’ priority, it is conceived so that participants can make it compatible with their other artistic activities, studies or work. 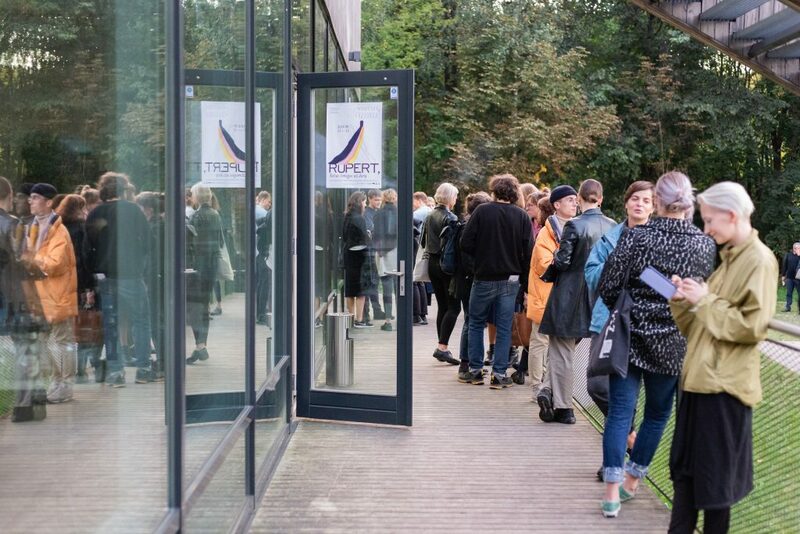 In previous years, well-established professionals from the art field have been guests of the Programme, including: Suhail Malik, Anna Gritz, Rick Dolphijn, Nina Power, Dan and Lia Perjovschi, Laurynas Adomaitis, Fatoş Üstek, Lina Lapelytė and many more. The Programme is developed alongside Rupert’s Public, Exhibitions and Residency programmes and so benefits each year from around 40 visiting artists, curators, writers, academics and researchers. In the course of the Programme, the participants’ will present their projects in the form of workshops, art labs or exhibitions. Rupert works in cooperation with Lithuanian or international partner organisations to realise these presentations. The 7th edition of the Alternative Education Programme is curated by the Rupert curatorial team (Kotryna Markevičiūtė, Adomas Narkevičius, Yates Norton) and coordinated by Adomas Narkevičius. This year lecturers and tutors will be Kate Cooper, Povilas Dikavičius, Victoria Ivanova, Ana Teixeira Pinto, Candace Goodrich, Ángels Miralda Tena, Monika Kalinauskaitė and other local and international tutors which will soon be announced. Our guest speakers will offer the participants lectures, reading sessions, workshops, excursions, or involve them in informal conversations and discussions. The rest of the Programme will be created and curated by you – the participants. We look forward to receiving your applications. If you are not an artist, curator or writer, please don’t be discouraged from applying — Rupert is interested in creative practitioners from various fields. March 12, 2019 – September 9, 2019 (at least 80% attendance of the Programme’s activities is compulsory, activities can take up 20-40 hours/month). Please send the completed application form (available here), CV and portfolio (no more than 5 works) to info@rupert.lt by February 15, 2019 (Friday, midnight, EET). We will confirm receipt of applications by email. Applicants selected for personal or Skype interviews will be notified separately. Final selections will be announced in early March. Applicants must have a good command of the English language (no formal language qualifications required). Applicants must also be based in Vilnius for the duration of the Programme and commit to 80% attendance of all Programme activities. International applicants must be from the E.U. or have a VISA that allows them to stay in Lithuania for the duration of the Programme. Secondary and university education, as well as previous work experience are not required but are taken into consideration. Applicants are not required to have previous experience in the field of contemporary art to apply. Rupert Alternative Education Programme is FREE for participants. Rupert is partly funded by the Lithuanian Council for Culture. Rupert’s Alternative Education Programme is supported by Vilnius Municipality, guests of Rupert’s charity dinner and other sponsors.